This has given my two year old, Jesse, and me a good deal of fun together. It really isn't a game. It offers an opportunity to play with large letters and numbers on the screen. When the program starts, it's in the Alphabet mode. 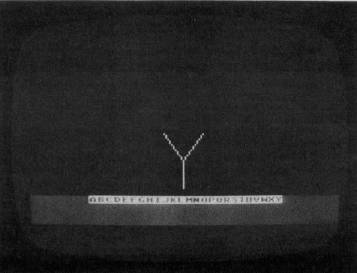 A large letter "A" appears in the middle of the screen, and a small reverse video "A" appears near the bottom. Each time Jesse presses the space bar, the next letter in the alphabet replaces the previous one in the middle of the screen, and the new letter is added to a growing alphabetic sequence at the bottom. I had originally planned to use a speech synthesizer with the program. But, while play testing it with Jesse, I discovered that I made an even better speech synthesizer. Although Jesse already can say his ABCD's, he is just now learning that the ABC song he has learned is really made up of things called letters. He sits on my lap and presses the space bar to see the letters. I say the names of the letters, and he repeats after me (sometimes). Or I may ask him questions like "What is the first letter of the alphabet?" or "Can you find the A?" It's all quite relaxed, but he is being exposed to the names, shapes, and alphabetical order of the letters. If he says the wrong name for a letter, I don't say, "That's not B." I simply say the correct name of the letter. He sometimes just sits and listens as I say the names, while he presses the space bar to advance the letters. One day he asked to see the Q when we were only up to D. Later, I added code which lets him put any letter at the top of the screen by pressing its key on the keyboard. After pressing individual letter keys, he can continue the alphabet at the bottom of the screen from where we left off by pressing the space bar again. At any time I can press the shift and space bar to start over with the letter A. If we ever get to the end of the alphabet, the string of letters at the bottom of the screen flashes ten times, and I make a big deal of it. But there are lots of other things to do, too. 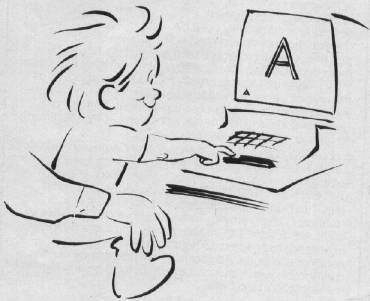 He can guess the name of the next letter or try to find a letter on the keyboard. Sometimes he just wants to see some favorite letters and touch them on the screen. Finally, I added the Numbers Game. To play with the numbers, press the SHIFT and the number one. Pressing the space bar displays the next higher number in large print in the middle of the screen. Numbers greater than 9999 will not fit on the screen. Pressing any of the digits, zero to nine, displays that digit in large print at the top of the screen. To start counting over with one again, press SHIFT and space. To get back to the alphabet, press SHIFT and A. These sessions are not very long – three to five minutes, at most. Jesse is usually a little impatient as the program loads from tape. Just about the time it's ready, he's decided he wants to play another favorite game (another excuse for getting a disk drive). Jesse has been playing at my computer since he was about 18 months old. By now he knows that you "press" the keys, not pound them, though exuberance can lead to banging. He has learned that the keyboard has letters, numbers, and symbols like "star" (*) and "arrow" (↑). A wrong letter match in "Letter And Number Play," VIC-20 version. 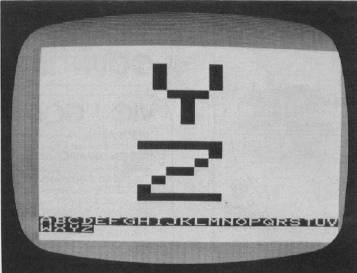 The computer awaits a match in "Letter And Number Play," Atari version.